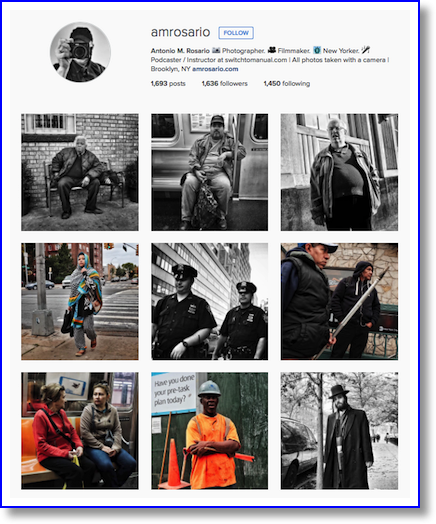 This week we’re joined by Antonio Rosario, a professional photographer and instructor based in Brooklyn, NY. He’s also a digital imaging and workflow consultant. In this conversation I attempt to learn the workflow he uses to make his iconic black and white street photography stand out. It takes a while for us to get to that point because we have a lot of fun talking about his progression from the early days of film processing up to today. We talk about RAW vs JPG and why he actually uses the JPG files most of the time (spoiler, his Fuji X100T does an amazing job of creating great JPGs), we talk about how he uses social media to further his business (spoiler, Instagram for the win). I really enjoyed your talk with Allison about B&W photography. Even as a novice photographer I got some good tips out of it. Your discussion with Allison about using color filters to enhance photos was intriguing and made sense, but left me with a question about how digital color filters work. I hadn’t thought about using a color filter to highlight an object or subject in a B&W photo. The example you gave was using a red filter to enhance skin tones in B&W photos. You explained this works because many people’s skin has red tones in it so using a red filter on a color photo while converting it to B&W “lightens” their skin tone in the photo. That’s a marvelous tip that can be extended to highlight other objects using color filters. However, this got me thinking about your use of the word “lighten” in this context. The way I understand it, analog color filters block all colors except one which gets through the filter. So a red filter blocks all colors except red which passes through the filter. In other words, filters can only block light, they can’t add light or lighten an image. I know that filters aren’t perfect so 1) some light from other colors will get through the red filter, just at a much reduced intensity, and 2) although red light passes through a red filter, it is slightly attenuated. So from my perspective, a red filter doesn’t lighten the skin tones, but instead reduces the red skin tones significantly less than other tones in the photo resulting in emphasized skin tones relative to other parts of the photo. So my question is do digital color filters behave as analog color filters and only block light? Or do they also bring up the average level of the photo after filtering resulting in a true lightening of the color which passes through the filter? So Steve, great question. I want to post a short reply because it’s late and I’m tired but I didn’t want to leave you hanging for too much longer. I should have mentioned that my brain still works in the world of film sometimes and this was one of those times. When I mentioned that red filters lighten skin, it’s because when you use one when shooting black and white *negative* film, the result is that more red light hits the negative film and is going to exposure the film longer. Longer exposure on negative film, or even positive till (transparencies) means a brighter image. So if a red filter is letting in more light, then those parts that are red in the original scene will show as lighter when viewed on the negative (and resulting print). Digital color filters on a black and white image simulate this phenomenon. How they do it, I have no idea. Digital magic I suppose. 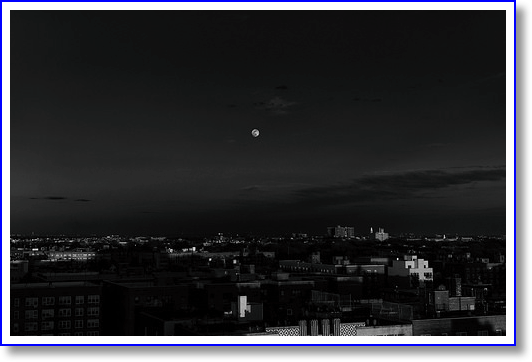 In Lightroom, you basically can convert your RAW file to B&W then have access to the color filter sliders where you can darken or lighten the different major colors in the image and have them lighten or darken in the B&W conversion. In SnapSeed, you can convert a color image to B&W using a straight conversion or one of three or four simulated color filters. Also, on the Fuji X-series cameras, you can shoot B&W with a simulated red, green or yellow filter. It’s nice to see this in a preview LCD because you can understand what tones will be affected by whichever filters you use. When I did B&W film photography, the major color filters I would use were red, orange, yellow, or green. Never blue. Red was great for getting dark skies, but when used on people, they’d glow white, almost like infrared photography. Orange was also good for skies but wasn’t as intense as red. Yellow was good for skies, getting rid of haze (since there was a lot of blue light in haze) and also good on foliage. The film that I used was panchromatic, meaning it captured (in B&W) all the color tones evenly. The only way to really set one color off was to either shoot with a color filter or do some fancy darkroom work. Just as an FYI, the glass plates used in the old days (say, the Civil War) were overly sensitive to blue light, which is why most of those images have white skies. This was akin to shooting the image with a blue filter attached. So I hope this makes some sense. I’m not sure I’ve answered your question entirely so let me know. Thanks for the explanation Antonio. I think I see what the filter is doing, but I think it has as much to do with the automatic settings on the camera as it does the filter. My guess is the camera is compensating for the reduced light from the other colors when the filter is applied and it automatically adjusts the aperture or exposure or ISO to let more light in – and that light is dominated by the light that the filter lets pass. So in the case of the red filter, the red areas are enhanced by the camera letting more of the red light through to compensate for the other colors in the scene that have been attenuated. I’m further guessing that if you set an analog camera to manual and applied a red filter over the lens, the overall image would get less light and the red areas would not be lighter relative to having no filter but they would still be lighter relative to the other colors in the scene. Nope. Digital filters are simulating what an actual filter would do to the colors. So, using a digital red filter simulation, the reds are lightened and the greens and blues are darkened. No exposure settings are being messed with. If it were a real glass filter on the lens, the camera *would* have to have exposure compensation because the red filter blocks light. How much depends on the factor number of the filter. And I’m not sure why you think the camera (actually, the processing software *in* the camera) would need to change the exposure to compensate. There is no actual blocking of the light going on. Remember, this is all only post processing of the RAW data. It’s no different than setting the picture profile to have more contrast, or less sharpening.